Could the answer to having it all be not having kids? 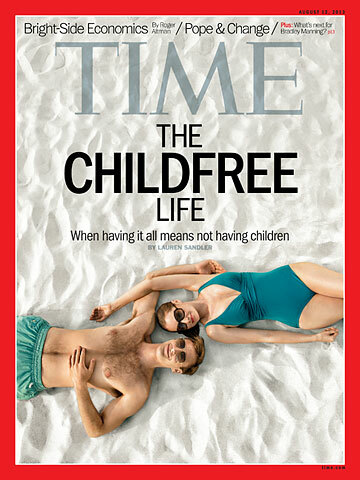 That&apos;s what Time magazine suggests with its latest cover story - The Childfree Life - and it&apos;s struck a nerve with female social media commentators around the world. The article&apos;s author, Lauren Sandler, asserts more couples are choosing not to have kids because it allows them to lead more fulfilling lives. She cites a Pew Research study that shows childlessness has risen across every racial and ethnic group in America, with one in five American women who do not have children during their childbearing years, compared to one in 10 in the ‘70s. Ragen Chastain agrees in her article for iVillage "I ain&apos;t having kids and it ain&apos;t nobody&apos;s business", saying: "I’m not even going to justify the idea that my completeness as a woman is based on becoming part of the stroller and sippy-cup set with a response." However, The Stir&apos;s Sarah Bernard says: "For many of us - if not most - having children is having it all." KJ Dell&apos;Antonio at The New York Times even admitted she is unlikely to befriend childless women: "Do we do it overtly or subconsciously — or just by excluding and including people in our lives based on proximity and similarity without realizing that the path of least resistance is one that, for a parent like me, includes mainly friends who are piloting similar family boats?" Perhaps the most ferocious of objectors to the Time article was journalist Kate Spicer who wrote at The Daily Mail that "Any woman who says she&apos;s happy to be childless is a liar or a fool". Kate recently admitted she&apos;s haunted by an abortion she had at 18: "In the bitterest of ironies, that terminated pregnancy remains the sum total of my reproductive history." At age 44 she deeply regrets her decision, as she finds herself unable to have a baby. And all the freedom, money and holidays in the world don&apos;t ease her pain. "While a child-free life looks fun on Facebook, no number of career highs, nights at the theatre, weekends away or adult pleasures can disguise the fact that it feels - there is no other word - empty," she writes. "Between today and the end of my life, I hope there are a few more decades. But, as time goes by, the idea of dying without children feels unnatural and sad." Kate muses that she "should have put having a child first", instead of focussing on her education and career. She adds that her "parents&apos; divorce put me off too". It wasn&apos;t until she was 40 that she met someone she wanted to settle down with, but he wasn&apos;t ready for kids. So she waited. And when she started trying for a baby, it didn&apos;t happen. Fertility treatments were unsuccessful. "Now, at 44, adoption is always at the back of my mind, but there is some distance to go before I feel my relationship will be ready to take on that challenge," she admits. She even wants to teach a class to 16-year-olds about "the importance of having a baby while you&apos;ve still got energy and fresh eggs in your ovaries". Kate also worries that not having children means she will miss out on unconditional love, especially when her parents are no longer around to give it. "As a rule, flawed as all parties may be, the parent-child bond is the commonest and most reliable form of that love," she says. "Sitting writing this at my mother&apos;s desk, surrounded by my grandmother and great-grandmother&apos;s things, I feel acute awareness that as my life enters its final half, it is with a diminishing circle of love. "The Motherhood Deniers are terribly excited about their friends. None of whom will be able to wipe their own bottoms in 40 years time, let alone those of their chums. And we all know nephews and nieces are not in the business of dedicating their lives to maiden aunts. "I have never met a woman who regretted having children. She surely exists, but not in my experience. I have met, however, older people who lament never having kids." Do you think childless women are "fools" for thinking they won&apos;t regret their decision? Or are Kate remarks out of line?